Fair Phone is an "ethical, open and built to last" smart phone. 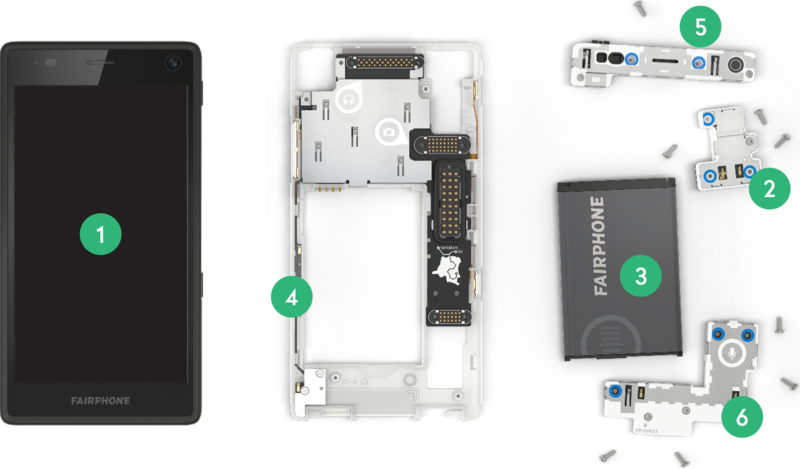 By adopting a modularity building system the Fair Phone allows you to repair or just upgrade its components (i.e. the camera, battery, case, etc.). Also, the supply chain is designed to be fair by adopting conflict-free metals and by having a transparent production environment. In the image (1) Display Module, (2) Camera Module, (3) Battery, (4) Core Module, (5) Top Module, (6) Bottom Module.